The 2013 Emmy nominations were announced just hours ago, but already, the Internet has exploded with TV writers across the country (including us) voicing their opinions on "how come Monica Potter/Tatiana Maslany/Jake Johnson/etc. didn't get nominated?!" Still, while we're upset the Emmys chose to ignore some of the most deserving actors on TV today, we're thrilled that they chose to recognize many of our favorites, including Scandal's Kerry Washington, who earned her first nomination for her work on the hit ABC show. 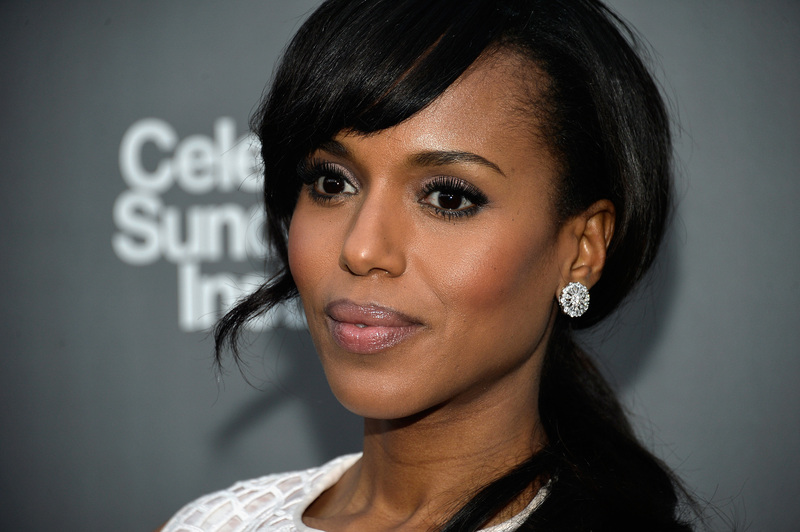 Washington is a hugely talented actress, and she's the reason we tune in to Scandal week after week. We're elated she was recognized by the Emmys — especially considering the ceremony's past whitewashing in the Outstanding Lead Actor and Actress categories. (Even this year, House of Lies' Don Cheadle is the only other non-white actor to be nominated for a leading role.) Since 2003, there have been only six leading role nominations, comedy or drama, for non-white actors, including this year's two. Cheadle was nominated last year for House of Lies, America Ferrera was nominated in 2007 and won in 2008 for Ugly Betty, and Bernie Mac was nominated in 2003 for The Bernie Mac Show. Six nominations in 10 years, when each year had at least 20 slots open? It's disturbing, but unfortunately, it's not entirely the Emmys' fault — it's the networks who continue, year after year, to provide a dismal amount of leading roles for non-white actors. Focusing on the lead actress race, the lack of nominations for women of color is particularly noticeable. Washington is the first black actress to be nominated for a lead Emmy since Cicely Tyson was honored in 1995 for Sweet Justice. That's 18 years. African-American women who starred in miniseries have fared better — eight have been nominated since 2000 — but still, those numbers are frightening. They're representative of the lack of diversity apparent on TV. After all, Washington is the first African-American woman to star on a network drama since 1974, when Teresa Graves headlined Get Christie Love!. Until Shonda Rhimes created Scandal, the idea of a black woman leading a primetime TV show was practically unheard of. When African-American women are cast on TV, they are typically in supporting roles, and tend to portray far less complex characters than white actors. Scandal —which features Washington as a strong, three-dimensional character — alone won't change the game, but it's certainly a start. The show's enormous critical and ratings success has proven that a black actress can lead a show just as well as anyone else, and so, hopefully, the shows that premiere over the next few years will reflect this truth. It's time for the networks, and subsequently, the Emmys, to recognize the need for diversity on TV. We don't live in an all-white world, so why does every primetime show pretend that we do?